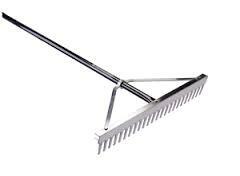 The aluminum landscape rake is ideal for grading and spreading loose soil, mulch, gravel, and other landscaping materials. This is not a leaf rake. Move material with the rake head tines. Level the material with the flat side of the rake head. If you have a very small area consider using the Metal Rake instead. * Please call us with any questions you may have about our rake landscape rentals in Petoskey, Northern Michigan & The Upper Peninsula.